On September 5, Jon Stewart was joined on the TODAY Show by Barasch & McGarry’s Director of Outreach, Ret. FDNY Deputy Chief Richard Alles and well-known 9/11 advocate John Feal. They discussed the importance of registering with the World Trade Center Health Program and warned about the soon-to-expire Victim Compensation Fund (VCF). They also appeared on Fox, NBC News, ABC News, MSNBC, and Telemundo. After a physically and emotionally draining but rewarding day, the work these three men did in shining a light on the 9/11 national health crisis is making a difference. We hope you watch the interview and help us spread awareness about the VCF deadline which must be extended. 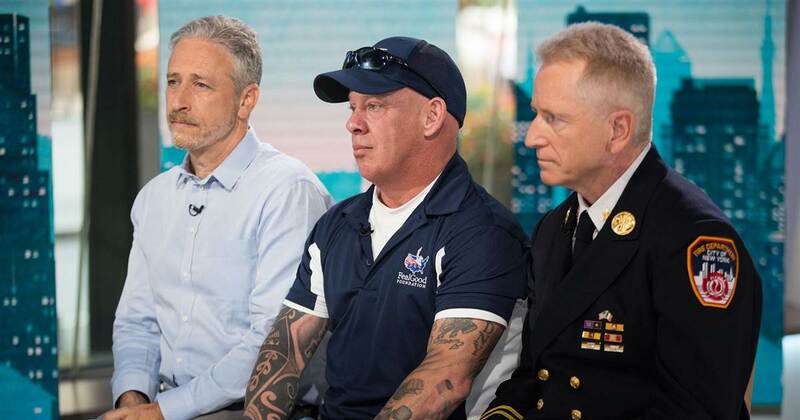 Former “Daily Show” host Jon Stewart joins 9/11 first responders former FDNY deputy chief Richard Alles and first responder rights advocate John Feal for an interview with TODAY’s Savannah Guthrie. The three men talk about how they’re championing the World Trade Center Health Program, which advocates for health care for 9/11’s first responders. “Everybody in the 9/11 community who doesn’t have cancer is looking over their shoulder, going, ‘When am I next?’” Feal said.